In 1872 Yellowstone was established as a National Park. The name caught the public’s imagination and by the close of the century, other National Parks had been declared, not only in the USA, but also in Australia, Canada, and New Zealand. Yet as it has spread, the concept has evolved and diversified. In the absence of any international controlling body, individual countries have been free to adapt the concept for their own physical, social and economic environments. Some have established national parks to protect scenery, others to protect ecosystems or wildlife. Tourism has also been a fundamental component of the national parks concept from the beginning and predates ecological justifications for national park establishment though it has been closely related to landscape conservation rationales at the outset. Approaches to tourism and visitor management have varied. Some have stripped their parks of signs of human settlement, while increasingly others are blending natural and cultural heritage, and reflecting national identities. This edited volume explores in detail, the origins and multiple meanings of National Parks and their relationship to tourism in a variety of national contexts. It consists of a series of introductory overview chapters followed by case study chapters from around the world including insights from the US, Canada, Australia, UK, Spain, France, Sweden, Indonesia, China and Southern Africa. 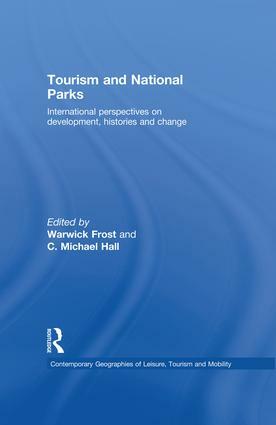 Taking a global comparative approach, this book examines how and why national parks have spread and evolved, how they have been fashioned and used, and the integral role of tourism within national parks. The volume’s focus on the long standing connection between tourism and national parks; and the changing concept of national parks over time and space give the book a distinct niche in the national parks and tourism literature. The volume is expected to contribute not only to tourism and national park studies at the upper level undergraduate and graduate levels but also to courses in international and comparative environmental history, conservation studies, and outdoor recreation management.